that displays current temps and conditions around the globe, and will hopefully make travel and activity planning easier. 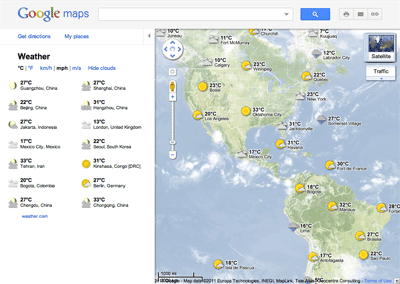 To add the weather layer, hover over the widget in the upper right corner of Google Maps and select the weather layer from the list of options. 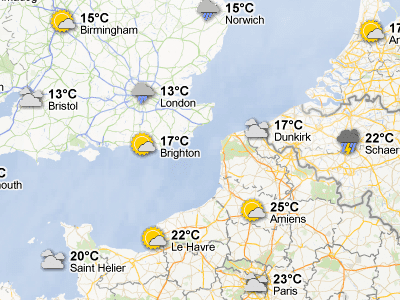 When zoomed out, you’ll see a map with current weather conditions from weather.com for various locations, with icons to denote sun, clouds, rain and so on. You can also see cloud coverage, thanks to our partners at the U.S. Naval Research Lab. And, if you look closely, you can also tell if it’s day or night around the world by sun and moon icons. Clicking on the weather icon for a particular city will open an info window with detailed data like current humidity and wind conditions, as well as a forecast for the next four days. 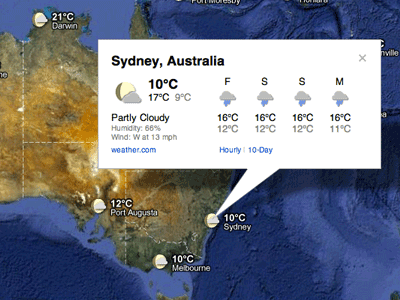 Below is the upcoming forecast for my location in wintertime Sydney, which seems to have the similar weather as London! Changing the units of wind speed (Mph/KMph) and temperature (F/C), and enabling or disabling the clouds (when you’re zoomed out), can also be done from the left-hand panel. Get started now and check out the weather layer here. Update 8/18/11 at 3:30pm: We've updated the post to clarify that while the cloud data for this layer comes from U.S. Naval Research Lab, the weather data is from our partner weather.com. Whether you’re organizing a trip overseas or a picnic at a local park, knowing the weather forecast is a crucial part of the planning process. Today, we’re adding a weather layer on Google Maps that displays current temps and conditions around the globe, and will hopefully make travel and activity planning easier.